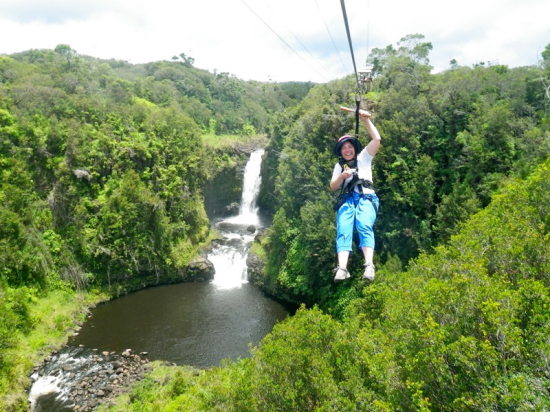 TOUR DESCRIPTION: Take your need for speed to new heights on this thrilling zipline, and Akaka Falls adventure. Enjoy a relaxing drive through Saddle Road with views of Mauna Kea and Mauna Loa on your way to the most beautiful falls on Hawaii. Covering nearly two miles of gorgeous tropical river gorges, our 8-line zip course is fun for the whole family. View multiple different waterfalls while soaring over 160 feet above them. Our certified staff will guide you over one of the longest lines on Hawaii Island at more than 2,400 feet in length! 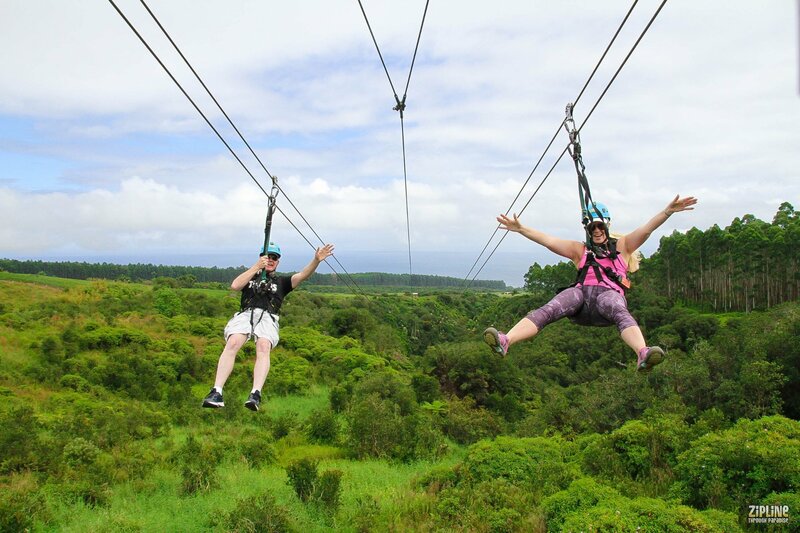 Ride the only all side-by-side dual-track zipline on Hawaii! After your zipline adventure enjoy a picnic deli style lunch. Next, take a short walk to a private waterfall where you can take a refreshing swim or just relax and enjoy the jungle scenery. Light snacks and water are provided through out the tour. Restrictions: No heart, neck or back problems, no pregnant women, minimum weight 35lb max weight 275lb max. Must be able to lift 15lb and walk up stairs and over uneven terrain. Guests under the age of 18 MUST be accompanied by an adult. Tour amenities: Sunscreen, mosquito repellent, all zip equipment. What to Bring: Closed toe walking shoes, camera - swimsuit & towel. Zip with Lunch and Swim Only.